1) Preheat oven to 180° C. Place the almonds on a tray and roast for 10 minutes in the oven. Let cool and then chop coarsely. 2) Reduce oven temperature to 150° C and line a baking tray with parchment paper. 3) Whisk the eggs with the vanilla and almond extracts. 4) In a separate bowl mix the flour, the sugar, baking powder and salt. Add the chopped almonds and the egg mixture and stir until a dough forms. Add more flour if it is too sticky. 5) Divide the dough in half, and roll each half into an 20cm log that is about 10cm wide. Transfer them onto the baking tray and bake for about 25-30 minutes. I probably baked mine a little too long (first try) and it was quite crumbly when chopped; so don't be afraid to take it out while it's still soft-ish with a relatively firm crust. Remove from oven and let cool. 6) Move the baked loafs to a chopping board and, using a sharp knife, cut them diagonally into about 1cm thick slices, transfer them onto the baking tray and bake again for 15 minutes on either side (max. 30 in total, turn over at half time). Remove from oven and let cool. 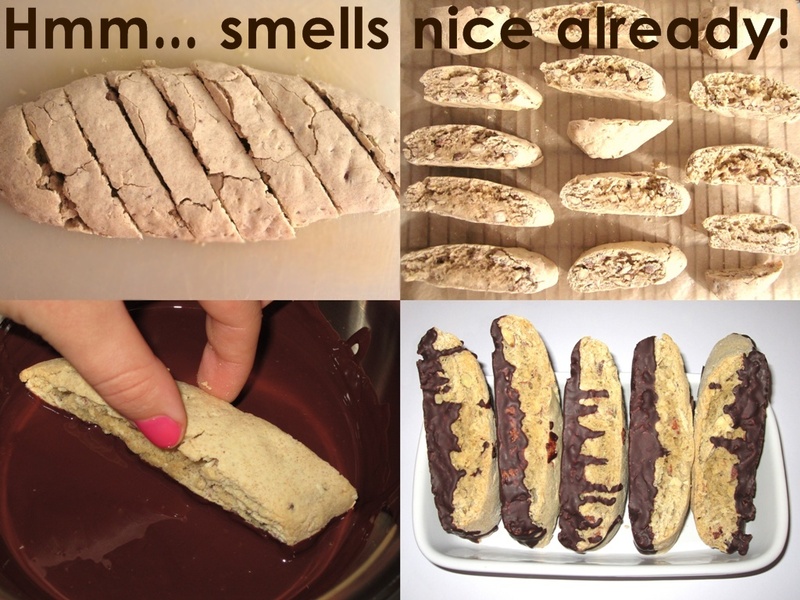 7) For Chocolate Dipped biscotti: Melt the dark chocolate in a heatproof bowl over a pan of simmering water. Dip the baked biscotti into the melted chocolate and leave on a baking tray (in the fridge) for the chocolate to harden.